Smo'dis leaned over the ground, staring at the pile of vomit he'd just dropped there. This was not good. He had been allergic to mojo for as long as he could remember. At first, it wasn't so bad. He'd drink a mojo water and get a little congested. No big deal. But it kept getting worse. First was the uncontrollable sneezing. Then the violent coughing. Then came the vomiting, and under extreme circumstances, he would pass out. This latest problem was going through a simple mojo gate. Usually he could just plug his nose and he'd be fine, but not anymore. And if he was reacting this violently to simple mojo gates, what would happen if he drank a mojo water? Or if some humie cast on him? Smo'dis shuddered at the thought. He couldn't go on like this. His allergy to mojo wasn't just affecting him anymore. He was part of a whole. . . he was part of the Shadowclan. And his allergy made him a weak link. Something had to be done, and fast. Smo'dis is a battle surgeon, but not even he could figure out how to cure himself. However, being skilled in the healing arts, he discovered that a good dose of cider made him feel somewhat better after a mojo attack. Naturally, what orcish problem can't be solved with cider? But cider alone wasn't the answer. While it tasted great, it impaired his ability to run. And it was losing effect too. . . There was only one thing left to do. Smo had to seek out an orc that was skilled in making medicines, drinks, and elixirs. This orc was his last hope. He had to find Korg. And find him he did. Smo'dis took Korg over to one side of the fort and explained the problem. 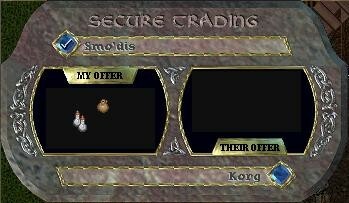 Smo'dis told Korg of his problem and Korg agreed to help. After carefully reviewing the facts, the pair decided that they would need some cider to add to whatever mix Korg schemed up. Smo'dis ran out and bought some. Smo'dis returned to the fort, with a full jug of cider and some discarded bottles he'd picked up along the way. He sought out Korg and delivered the goods. Smo'dis had done all he could. The rest was up to Korg. Author's Note: This story was originally planned to be a two-author two-part story; unfortunately, Korg disappeared shortly after "Allergic" was written. Therefore, Smo'dis never lost his mojo allergy.